Take your home cinema experience to breathtaking depths of surround-sound immersion with the Onkyo HT-S7800 5.1.2 channel Dolby Atmos home theatre system. 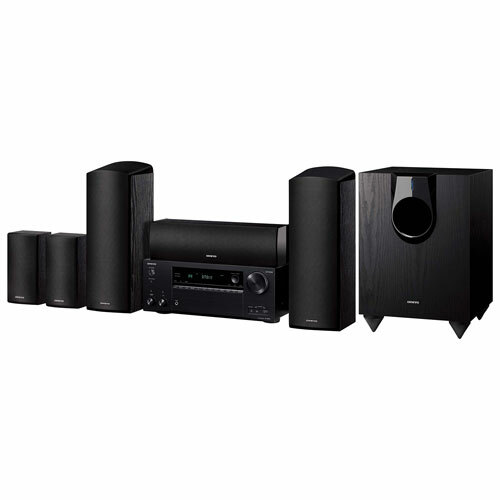 It features the HT-R695 7.2 channel receiver and a high-quality 6-speaker system that includes a subwoofer and 2 Dolby Atmos-enabled left and right front speakers with upward-firing drivers. HT-R695 7.2-channel network AV receiver delivers 100W RMS per-channel (8ohms, 20Hz - 20kHz, 0.08% THD, 2-channels driven) to reproduce true cinema-quality surround sound. High-current amp design, non-phase shift amp circuits, and Dynamic Audio Amplification technology ensure clear, realistic sound that stimulates total immersion. AK4458 384kHz/32-bit DAC, 32-bit digital signal processing engines, and Onkyo's VLSC circuitry produce smooth, noiseless analog signals, faithful to the original sound recordings. High-quality 6-speaker system includes a centre channel speaker, left and right rear surround speakers, a 120W subwoofer, and left and right 2-way bass reflex Dolby Atmos-enabled front height speakers. Support for 4K video pass-through at up to 60fps, 4:4:4 colour sampling, HDR, and 3D video mean Ultra HD content and more, from all your HDMI-connected sources, reaches your screen in full glory. HDCP 2.2 support covers you for the future of 4K and Full HD content from Blu-Ray, streaming, and broadcast services. Dolby Atmos surround sound format envelops the room in multidimensional sound so you feel like you're in the centre of the action. Create a Dolby Atmos 5.1.2 surround setup with the included Dolby Atmos-enabled upward-firing speakers and find yourself fighting the urge to duck for cover when the big shootout begins. Dolby sound up-mixer can process content not originally mixed for Dolby Atmos, and optimize it for distribution to the flexible speaker layouts of a Dolby Atmos system. DTS:X surround-sound (available via a firmware update) creates a lifelike audio experience by placing sound where it would naturally be heard. Multi-channel decoding of surround-sound formats including Dolby TrueHD and DTS-HD Master Audio. Built-in Wi-Fi certified wireless LAN, Bluetooth, and AirPlay give you the flexibility to stream content from a variety of sources, from mobile devices to online streaming services. Access Internet Radio and music streaming subscription services like Spotify, TuneIn Radio, TIDAL, and Deezer (subscription may be required). Advanced Music Optimizer DSP technology improves compressed digital audio quality (including Bluetooth streamed audio). Process compressed, lossless, and hi-res audio formats including MP3, WMA, FLAC, WAV, AAC, Apple Lossless, and DSD 5.6MHz. AccuEQ Room Calibration featuring AccuReflex technology uses an included mic to listen to your space and make automatic adjustments to optimize object-based audio through the included speakers. Multi-room audio with powered Zone 2 allows you to simultaneously send audio from a second source, such as Internet Radio or your Apple TV, to speakers in another room. FireConnect multi-room audio lets you stream digital and analog audio to select Onkyo or other FireConnect-compatible wireless speakers in another room. A phono input allows you to connect a turntable. Go ahead, dust off that old record player and your dad's vinyl collection to enjoy some oldies. USB 2.0 port with Mass Storage Class USB memory playback capability lets you enjoy content directly from a connected and compatible flash drive or media player, including encoded Dolby TrueHD soundtracks. 2 component inputs, 2 composite video inputs, 3 digital audio inputs (2 optical and 1 coaxial), and 8 analogue audio inputs offer flexible options for connecting a variety of AV components. 2 parallel subwoofer pre-outs and location-numbered speaker terminals make setup easy. PLL (Phase Locked Loop) Jitter-Cleaning Circuit Technology for S/PDIF Audio. Full disclosure -- I'm not an audiophile and am just getting started in the HT space. I wanted a HT system that would not break the bank and would still deliver great features (such as Dolby Atmos and Dolby Vision, the latter available via a firmware upgrade) and connectivity options. This HTIB checked all boxes for me! Since this is my first HT system, I decided to go with a HTIB solution that would save me money while delivering the experience I was looking for. Ignore the comments from people saying there's an issue with the subwoofer -- if they had read the manual they would know that the blue light on the unit only turns on after the signal goes above a certain threshold. That's very explicit in the manual! The bass output levels can also be adjusted in case you think the threshold is too low. I think this is a great system for those just starting out (those like me who don't have a lot of experience building a system from scratch and don't want to spend hours doing research and thousands of dollars in equipment). It delivers solid performance at an affordable entry price. Totally recommended! I have another review on this product, I decided to keep the system as it really sounds great! I purchased this system last week, it took me about an hour to connect the speakers, the main use for this system for me is music, but on the side I wanted to have a surround system. Connection is so easy, wires and speakers are color coded, speakers come with holes so you can attach them to the wall so easy. Then I started to play... sound is so great, sub-woofer preforms great, with a bit adjustment you get a clear and crisp base, I can't go more than 80 on volume ( it has 0-100 range). All together system performs so great, no doubt that it's a great buy BUT... If you're a music only fan, and your ears likes to separate all instruments in a song then this system doesn't deliver that. I knew that I had to go for a stereo system with probably two descent tower speakers but my budget was limited so I thought this is a good buy. I'm going to return the system but I give it 5 stars because it delivers 100% of what it has to. All receivers in my experience are more powerful than what the speakers can handle when it comes the theatre "system" packages. I can hear the speakers start distorting at volume 85 but at that point its like being on a concert stage. Perfect for a large room and a party but if you need that club experience you would need tower speakers that can handle 100 watts RMS on each channel. The Atmos enabled front speakers are great and the potential of this receiver is greater. 1st day had the intermittent issue with the sub happened on the 1st night because the volume was at 30 but no problems the next day. Seems the sub will activate when needed. All receivers in my experience are more powerful than what the speakers can handle when it comes the theatre "system" packages. I can hear the speakers start distorting at volume 85 but at that point its like being on a concert stage. Perfect for a large room and a party but if you need that club experience you would need tower speakers that can handle 100 watts RMS on each channel. The Atmos enabled front speakers are great and the potential of this receiver is greater. 1st day had the intermittent issue with the sub happened on the 1st night because the volume was at 30 but no problems the next day. Seems the sub will activate when needed. Glad I bought it on a 33% off flash sale! I TORE DOWN MY ENTIRE ENTERTAINMENT SYSTEM FOR THIS NEW ONE I HAD TO ORDER AND THE KNOBS AREN'T ATTACHED. I AM SO ANGRY RIGHT NOW AND I DRANK LIKE 4 BEERS SO YOU DON'T WANT ME IN YOUR STORE, TRUST ME. FAULTY PRODUCT THAT I HAD TO HAVE SHIPPED. SAD! I'd write to tell you how much I like my system but can't since I'm still waiting for my tv. The Onkyo came quickly but the tv is going to be over a month wait for some reason. More bells and whistles than you'll ever need. I had initially bought the HT-S7700 but it came with a defective speaker so they gave me a great deal to trade up to the brand new 7800. Like the older versions of Onkyo systems, set-up is not that easy. You'll spend a few hours just hooking this system up and trying to figure out and fine tune all its features before you're satisfied. In fact, this system is probably meant for the more advanced electronics aficionado. So many deep down adjustments can be made to tweak the sound, I got lost in all the technical babble of Hz, kHz, fps, passover, crossover, bi-amp etc. I just wanted a crisp, clear and loud surround sound system, and it does deliver on those things, it just takes a while to get there. One minor disappointment is that the 7700 had Sirius XM built into it and the 7800 does not, not sure why they took it away on the newer version. No biggie though as I do have the Sirius app on my phone so I just use the systems built in Apple Air Play to listen instead, it's just not as convenient. Also, the subwoofer constantly turns off and comes back on while watching regular TV, which is quite annoying. (The HT-S7700 did the same thing while I had it). I'm thinking you have to be at a certain volume or something for it to kick in, maybe something to do with Hz, kHz, or some other setting I haven't figured out yet. There's nothing in any of the instructions that says anything about the subwoofer, probably going to e-mail Onkyo on this one. Other than that, I'm quite satisfied with the sound of this unit. The subwoofer DOES stay on while listening to tunes, and it thumps pretty good. The systems volume setting goes from 0-100, and I can't crank the AC/DC over 75-80 without the windows rattling, so I guess I'm happy with that.